1 high-ranking artist across all channels in February and March will be selected jointly by OurStage and Powderfinger. Winning artist will receive an interactive weekly report detailing where the CD is being played and what type of airplay it is receiving. 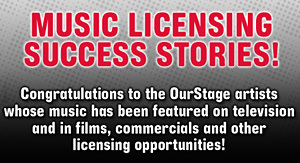 Awarded to 1 high-ranking artist across all Music Channels in OurStage's monthly competitions; Prize awarded according to the OurStage monthly competition terms and conditions. Airplay cannot be guaranteed.